A larger light weight travel pack balloon! • Ultralight weight 70,000 cu ft Tekno 70 envelope weighs less than 70kg using Ultralite silicon coated fabric. 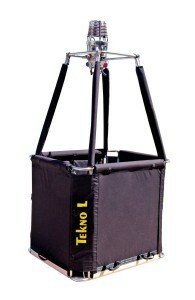 • Extensively tested fold down composite sided Tekno L basket weighs in at less than 50 kg and is capable of flying up to 4 people in its generous 1.0 x 1.2 x 1.1m high configuration. 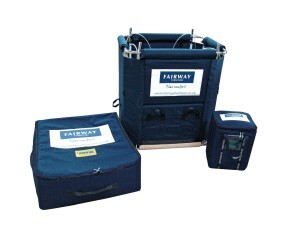 It is equipped with step holes and easy carry handles. • Powerplus Sport or MK-32 double burner options are available. • Cost option of the unique Tekno external tank security system is available. • Padded luggage bags are available for Tekno L basket and burners. • The Tekno L basket can also be supplied with a range of light weight envelopes from 50,000 cu ft to 120,000 cu ft.